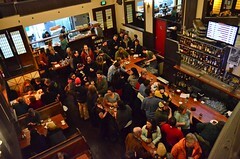 This is the 2012 Seattle Beer News list of the Top 10 Beer Spots in Seattle. Many great bars, pubs, and breweries won’t make this list; that doesn’t mean they aren’t outstanding places. Check out the previous post for #6. Thanks to +Riuss for the image. With so many great beer spots in town, it can be tough for some new bars to get noticed. I don’t think The Pine Box is having that problem. Their combination of outstanding beer offered in a beautiful, unique atmosphere is getting them noticed for all the right reasons. The Beer: When an ex-manager from the renowned Brouwer’s Cafe opens up a beer bar (with 2 other beer-loving friends), you can expect special things. The 33 taps of beer focus on American craft beers, but they also rotate in selections from all over the map, such as the Mestreechs Aajt Flanders Red from The Netherlands that was on tap recently. Like any NW beer bar, they have the hopheads covered, but they make sure to include an array of styles, including saisons, sour beers, stouts/porters and various strong ales. Perhaps the most unique aspect of their tap lineup is their Randall tap. They have a contraption called a Randall built into their bar that allows them to stuff it full of hops, coffee, chocolate, or whatever else, and then run a beer through it into your glass. Using a Randall to pour beer occasionally is nothing new. But, having a full-time Randall in your tap lineup might be a first. To top it off, they have two flat screen televisions hung above the bar where you can see the list of beers on tap. It’s updated each time a keg is changed, and their website is updated simultaneously. Ah, technology. The Food: The focus is on a selection of wood-fired pizzas for dinner, including unique combos like pulled pork and kimchi, arugula and walnut pesto, and Manilla clams with caramelized onions and pancetta. They also do brunch, offering frittatas, steak and eggs and a few breakfast pizzas. The Atmosphere: Yeah, it is kind of a unique building for a bar. Located in a building that used to house the Butterworth Funeral Home, The Pine Box is situated in a grand room with the feel of a beer hall mixed with a cathedral. High ceilings give the appearance of more room than there actually is, and reclaimed church pews were refinished by co-owner Dean Hudgins to use as seats for some of their tables. In addition to the main downstairs room with the bar, there is an upstairs loft area with tables, and a covered patio out the side door. It’s really a pretty beautiful place. Overall: Not even open six months yet, and The Pine Box is already squarely entrenched in my Top 5 Beer Spots. The combination of amazing beer and a cool space make it worth a visit. Here is hoping that more ex-beer bar managers open up amazing places. My new favorite place. Well selected beer menu and tap turnover is high which keeps me coming back to drink what’s new on the pour list. And I love the Randall. It does get crowed though. Neat space, but I probably won’t be back. I made a stop at Pine Box during Seattle Beer Week’s opening night, and the bartender seemed to be actively unfriendly towards me and others nearby. I really wanted to like this place, and the taps were great, but I just felt like I wasn’t cool enough to be welcome. I’m similar to “I-Drink-Beer”; I tried this place, but didn’t like it. They advertise 16 oz. (Pint) of liquid joy (well, maybe if you “crown” their glasses with water). I drink beer, too, and any decent pour (with head/ garnish) in a Pint glass is pretty close to 12 oz., not 16 ! I was hoping for a 20 oz. glass for a good 16 oz. pour with head. No such luck. “knock yourself out” … in liking this place. I can got to other places (Hopvine) for a good/great beer, a good pour @ a good $ Price ! Everybody’s a little on edge during festivals – a lot of new folks with high expectations and little patience show up – but when I was at Pine Box for the Randall event during Beer Week, everybody was friendly and it was the best beer (plural) I had anywhere during Beer Week (including the 2009 RR Supplication at The Dray). I wish they had five Randalls running every day. Everyone I know (and I brought most of them here) loves it. Good and affordable pizza at happy hour, wonderful back patio on a sunny evening, and that great up-to-date beer list on the screen. I feel sorry for all the folks who have had bad experiences at the places I love and wouldn’t go back to if it was the same for me.